Massing's effort ensured his team-mates' ambitions were fulfilled, however, as his rhino-like charge sent the Argentine, just regaining his footing from the last attempt on his life, slamming into the turf. Amusingly, Massing then kicked out at an opponent blocking his route to his boot, lost in the clash, before putting it back on in the vain hope that the ref would allow him to play on. He didn't. The Netherlands' hack hapiness was eventually punished by karma in Johannesburg as Spain lifted the trophy, but not before Vicente del Bosque's boys had taken some serious punishment. Referee Howard Webb was forced to dish out a record 14 yellow cards in the final, which eclipsed the previous record of six set in 1986. There are few matches that contain so many wince-inducing tackles that picking a 'most shocking' proves difficult. Then again, there aren't very many matches that are more commonly referred to as 'The Battle of Santiago'. But the clash between Chile and Italy in World Cup '62 was one such encounter. It was a game that has to be seen to be believed; the British highlights introduced by David Coleman as "the most stupid, appalling, disgusting and disgraceful exhibition of football, possibly in the history of the game". The match was rife with shocking tackles, punches and police intervention. Giorgio Ferrini was ejected after 10 minutes, and Mario David followed half an hour later for kicking Leonel Sanchez in the head in what the commentator calls "one of the most cruel-blooded and lethal tackles I have ever seen". It says something about the 'Battle of Santiago' that the referee, Ken Aston, was actually the man that revolutionised football's disciplinary system. Obviously harrowed by the events that took place on the field that day, it was Aston's idea to use red and yellow cards, and they have stuck since the 1970 World Cup. The roots of this infamous knee-high tackle were bedded three years previously. A mistimed Keane lunge at Leeds' Haaland resulted in a cruciate ligament injury for the United skipper – an injury to which the incensed Haaland was, unsurprisingly, less than sympathetic. The Norwegian stood over Keane's prone figure and denounced him (somewhat vociferously) as a faker. Shockingly, Keane held a slight grudge about these actions, and in the 2001 Manchester derby Keane saw (or, rather, plotted) an opportunity for revenge, ensuring this 50-50 ball had similar odds of then-City star Haaland being able to walk again. A red card, five-game suspension and £150,000 fine followed, but hardly seemed a fitting punishment after the level of pre-meditation was revealed in Keane's autobiography. Next page: "I thought he was dead"
With the score at 1-1 in the 1982 World Cup semi-final, France substitute Patrick Battiston bore down on goal, chasing a long ball that had also alerted German keeper Harald Schumacher. The two raced towards each other at speed, but neither backed out of this football version of chicken. Battiston was focused on the ball, and reached it first, firing past the onrushing custodian. Schumacher -– obviously the smarter of the two – decided to ignore the ball completely, and concentrated on surviving a crash by leaping and turning his body into his opponent. Schumacher slammed into the Frenchman, catching him full in the face and immediately knocking out three teeth. Battiston was prone on the turf, toothless and with vertebrae damage, but the referee decided no foul had been committed and resumed play, much to the astonishment of players and fans alike. "I thought he was dead," said Michel Platini, "because he had no pulse and looked pale." Germany eventually won the game on penalties after a 3-3 extra-time draw, and when the goalkeeper was informed of the damage he had caused he simply replied: "If that's all that's wrong with him, I'll pay him the crowns." Derby matches are always hot-blooded affairs, and the clashes between Standard Liege and Anderlecht are no different. But this fixture featured one terrible incident that has taken their rivalry to another level. The season before, then-starlet Axel Witsel was the hero who scored the decisive penalty in Standard's play-off win against Anderlecht that brought their second successive title. In this derby, however, he committed one of the most hideous football tackles ever recorded on camera, with a savage lunge on Anderlecht defender Marcin Wasilewski leaving the Pole with a double open-tibia fracture, and the watching world wincing, appalled. An unbelievably lenient €250 fine and 10-game ban followed – one that was soon reduced to eight matches, much to the consternation of Belgium and most of the football world. To further endear himself to the Anderlecht faithful, the return derby saw him leap into another terrible challenge (on Roland Juhasz) and see red once again. Mavinga only played nine league games for Genk while on loan from Liverpool in 2011, but he certainly made his mark in his final appearance for the Belgian side – or, more specifically, on poor Standard Liege player Carcela. In attempting to hook a loose ball out of play, Mavinga inadvertently swung a boot that almost decapitated his Moroccan opponent, leaving him with a broken jaw and nose that required surgery. "I did not sleep well, I thought I had killed him," a distraught Mavinga said later – something his haunted victim attested to. "I realise that I've been very lucky," said Carcela. "Thank God I'm still alive. After all, I could be dead." Mavinga never played for Liverpool and has since spent time at Rennes, Rubin Kazan, Stade Reims and Troyes. Carcela can be found hopping off the bench for Granada these days. Calling Graeme Souness hot-headed is a bit like saying Donald Trump is divisive. About two minutes into this video of Rangers' fine victory over Romania Steaua Bucharest, the Scot ploughed into his opponent's thigh with his studs raised, and a very deliberate downward thrust. While the offender may not be surprising, the offence is. The unusual thing about this particular incident is that the Sky Sports charisma-vacuum wasn't making a tackle. He had the ball at the time. That's right: Souness was dribbling, saw someone attempting to nick the ball from his toes, so nicked a chunk out of their leg before they got their tackle in. He protested long and hard that he was in fact the innocent party, rubbing his leg and showing the proof (or lack of it) to the referee. Unfortunately for Souness the ref had eyes, and promptly sent him off. Rangers went out on aggregate. The heat makes us all do funny things: we get a bit irritable, a bit snappy. It seems to affect some more than others, however, and Ben Thatcher is a fine example. In the late summer hum of 2004 he went mental. During Manchester City's pre-season tour of China, his elbow caused Yang Chungang to suffer a collapsed lung, and less than three weeks later he became the most hated man in English football with a horrendous assault on Portsmouth's Pedro Mendes. As he and Pedro Mendes ran for a loose ball near the touchline, Thatcher intentionally led with his elbow, sending Mendes sprawling into the advertising hoardings and knocking him unconscious. 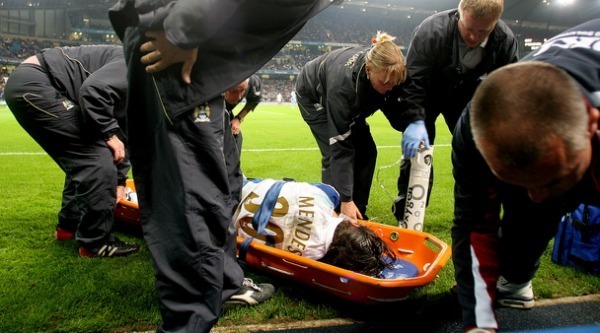 Mendes needed oxygen at pitchside and suffered a seizure while being transferred to hospital, where he would spend the night. The tackle was so bad that his own club issued Thatcher with a six-match ban on top the FA's eight-game suspension. He was also served with a 15-match ban suspended for two years. Portsmouth's Matt Taylor echoed the thoughts of the thousands watching, incensed by the referee's decision to only hand Thatcher a yellow card: "How can that not be a sending-off? What do you have to do, kill someone?" he understandably fumed. Next page: "Ref, he headbutted my foot"
There's seconds remaining in a clash with your local rivals, and you haul down one of the opposition inside the area. The scoreboard reads 2-2, and you could now be to blame for your side failing to pick up a point. You're angry, and look around for something to kick – but all you can see is the opponent you felled, lying prone on the grass like a big blue piñata. So, you boot him several times and stand all over him before giving his mate a little smack in the face. That's natural, right? Real Madrid's Pepe thought so, shown a red card and escorted from the pitch by team-mate Iker Casillas after his savage release of frustration all over Getafe's unlucky Casquero and his buddy Juan Albin. Unfortunately for Pepe, the Spanish FA didn't agree and handed him an eight-game ban ruling him out for the rest of the season. And if you thought things couldn't get any worse for Pepe's plaything Casquero, his spot-kick was saved by Casillas before Gonzalo Higuain scored a brilliant winner. Most people think New Zealand is a relatively soporific place. Shame nobody told Waitakere United striker Commins Menapi of the Solomon Islands before he unleashed this horror on Auckland City’s Riki van Steeden. The Auckland player had been sent off in these two sides’ previous encounter – adding weight to the theory that strikers can't tackle – so there was definitely a feeling of unfinished business lingering in the atmosphere surrounding this New Zealand Football Championship Grand Final. Menapi was elbowed in the head early in the game, which evidently left him seeing red. Twice, that is, after he was promptly dismissed for this foul and banned for six games. Steeden? A broken leg for his troubles.